As technology continues to evolve, it is proving to have a tremendous impact on the commercial real estate sector. Opportunities for technological innovation now exist in virtually every corner of the real estate industry and commercial real estate professionals will find that their ability to remain competitive is integrally linked to their ability to leverage the latest technologies. There are now several key areas worth watching in regards to technology in the CRE industry. Now that mobile has surpassed desktop usage, commercial real estate professionals need to be even more cognizant of the importance that mobile will play in their industry in the future. Due to the nature of their work, commercial real estate professionals typically need to be on the go in order to meet the needs of their clients. Unfortunately, this can often mean being away from the office in an effort to visit relevant subject properties. The inclusion of a mobile component in commercial real estate applications makes it possible for CRE professionals such as appraisers, developers, brokers, and landlords to stay completely in touch. In the past, commercial real estate developers typically had no other choice but to employ teams of analysts to gather relevant demographic data and evaluate that data in order to learn more about investment opportunities. Today, that is no longer the case. Open data initiatives have made it possible for data to be delivered on a regular basis, thus eliminating the need for more time-consuming and expensive independent research projects. Property management has always presented its fair share of challenges, but a wealth of new tools is now helping to eliminate some of those hurdles. New software offerings assist management companies and property owners with more easily tracking and supervising commercial real estate assets. 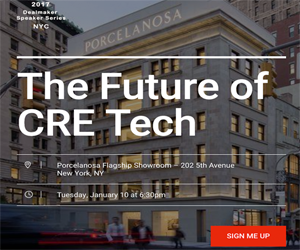 While this sector of the CRE tech field is in the early stages, there is a tremendous opportunity for growth in this field, and it is an area that CRE executives cannot afford to ignore. When multiple listing services were first introduced online, they made significant strides in terms of making it easier for brokers to access information about competitive properties and provide their clients with more options. Today, tech-based brokerages have once again revolutionized the real estate industry by giving brokers and their clients increased global access. This is an area that continues to grow on an almost-daily basis and which will certainly expand even more in the future. Changes in the regulatory system have now made it possible for innovation in the commercial real estate lending industry to thrive and those changes have naturally had an impact on the commercial real estate industry as a whole. Just a few of the changes we have begun to see include the ability to transmit contracts and conditions paperwork digitally, thus reducing the time required to complete transactions. In the future, we will likely see many more innovative solutions in this sector.